An innovative, complete insulation solution. Engineered as a continuous insulation system, the SMARTci 2-1 system is revolutionary in the way it eliminates the problem of thermal bridging with no through-wall fasteners. The SMARTci Systems boasts the highest thermal efficiency ratings in the industry for both warm and cold climates, and it’s simple, easy and cost effective. GREENGirt: Our award-winning steel and fiberglass-reinforced polymer (sFRP) girt and FRP Spline. Pre-cut Rigid Insulation: Class A, foil-faced polyiso, Phoenolic or XPS insulation panels, custom profiled in factory to connect seamlessly to GREENGirt. No Thermal Bridging: SMARTci is designed to provide an insulation system free of metal-thermal bridging. By utilizing insulated composite sub framing GreenGirts, the thermal “short circuit“ is simply eliminated. 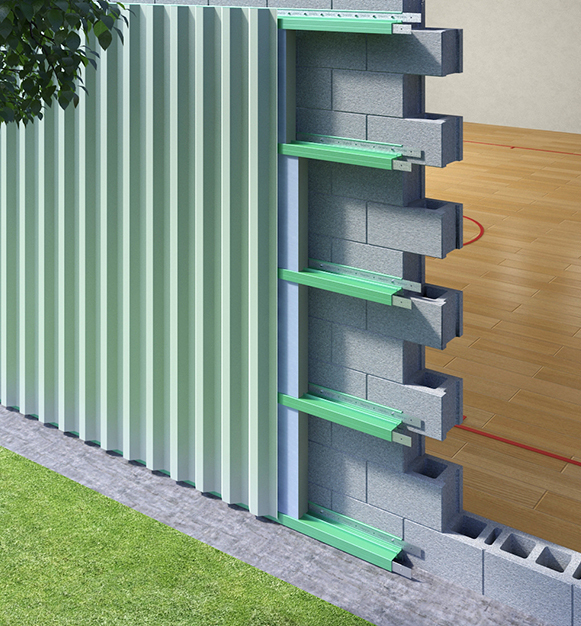 The splines of our GREENGirt sFRP connect to our pre-profiled rigid insulation panels, and act as sub-furring to house the CI and provides a universal cladding attachment support – ensuring zero thermal bridging. The SMARTci System is attached with no through-wall fasteners or metal attachment materials penetrating through the continuous insulation system creating cold spots for condensation inside your walls. The finished product is a high-performance CI building envelope with the highest thermal efficiency ratings available.